Kids Have Strokes – Say it. Then do something about it! 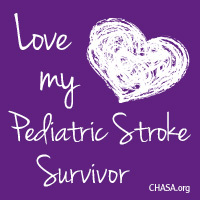 May is Pediatric Stroke Awareness Month! There is strength in numbers and you can join the movement to increase Pediatric Stroke Awareness. This page will give you tools to help you raise awareness. Set up your fundraising page and share your story! CHASA Babies Have Strokes Infographic – Download, print and hand out this Babies Have Strokes Infographic to help others learn more about pediatric stroke. If you need larger poster size images, Contact Us. 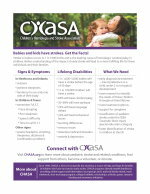 CHASA Brochure – Download, print and hand out this brochure to let others know more about how CHASA helps kids and their families. Help families in your community locate CHASA for support and information by distributing to therapy clinics, doctor offices and early intervention teams. Let’s create a local group in your community. Raise Funds for CHASA Projects and Share Your Child’s Story – Follow this link and click on Fundraiser for this charity. Add photos, videos and your child’s story, then ask friends, family and your community to donate. They can even set up their own fundraising teams under your page! CHASA help families and kids. And, most important of all – we connect thousands of families around the world with others who share similar experiences. You are not alone. Connect with other Pediatric Stroke Survivor Families who Understand – You’re not alone. CHASA families have been on this journey for decades and we have paved the road for you. Connect with other families in our general groups – on Facebook or via email. Join our specialty groups – Epilepsy, Pediatric stroke after age 1, Shoe Exchange, Homeschooling and more.